As the first retrofit self bag drop project in Japan Materna IPS, together with its local partner TKK, has secured a contract to install our Drop.Go solution in the newly built Terminal 2 of Nagoya Chubu airport. The Materna Drop.Go solution offers a simple and quick way for passengers who have already checked in for a flight to put their luggage into the baggage handling system. By simply scanning a boarding pass, bags can be dropped off within seconds. Nagoya Centrair is one of the most modern airports in central Japan in an important industrial region for many international companies and tourists alike. The new terminal will be dedicated to Low Cost Carriers. 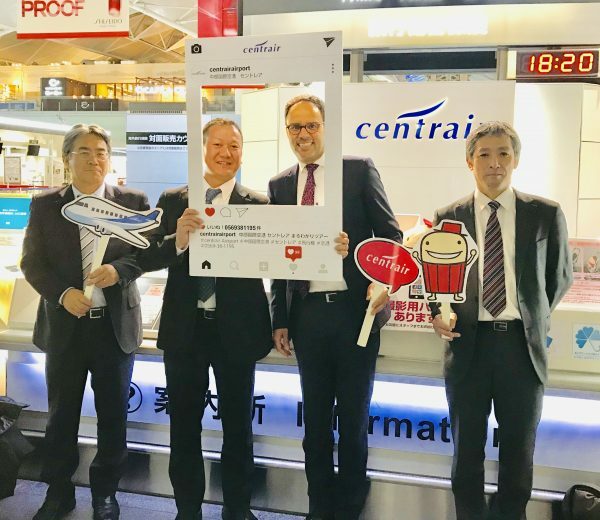 Nagoya Centrair T2 will be up and running until end of September 2019 to extend capacity ahead of the Olympic and Paralympic Games in summer 2020 and offer travelers a pleasant and efficient travel experience. Materna IPS has entered into a partnership with Toyo Kanetsu K.K. (TKK), the leading provider of baggage handling systems in Japan. Together the two companies will bring their joint expertise as leaders in their respective fields as a joint offering to the Japanese market. Innovative solutions around passenger- and baggage processing will help the Japanese airports to tackle the continued growth in air travel from and to Japan. A dedicated team of experts from both parties will provide consulting, installation, field services, maintenance and management of proven solutions tailored specifically for the requirements of the region. Dr. Georg Oschmann, Executive Vice President Business Line Mobility confirms that Toyo Kanetsu is the ideal partner for Materna IPS to deliver the best solution possible to the Japanese market and is excited about the upcoming projects that the partners already collaborate on.